As an admin, it’s important to properly portray your communication and organizational skills. This sample resume shows you how. As an office assistant, it’s important to portray your communication and organizational skills properly. View the sample resume below, and download the office assistant sample resume in Word. 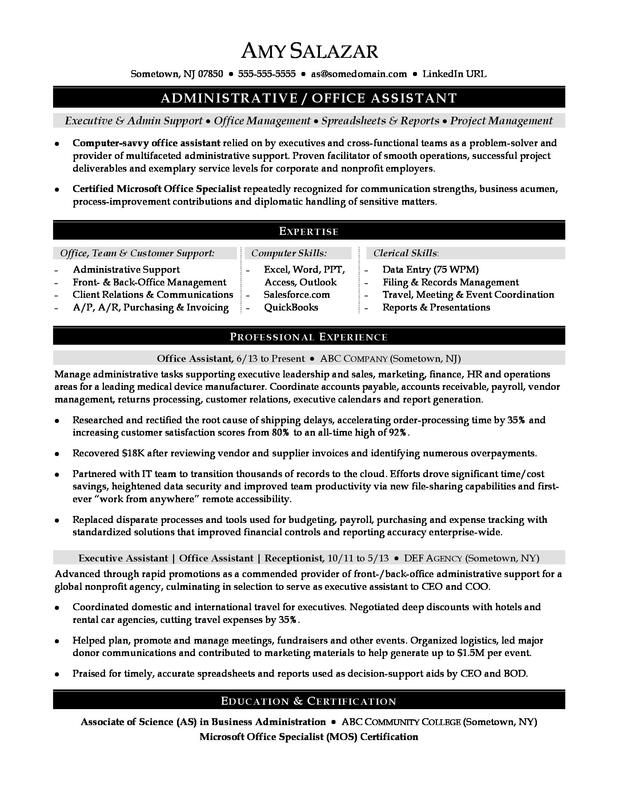 See a sample resume for an office assistant seeking a promotion. According to the Bureau of Labor Statistics (BLS), you'll find the highest level of employment for office assistants in the following states: California, New York, Texas, Florida, and Pennsylvania; and in the following metropolitan areas: New York City, Los Angeles, Houston, Chicago, and Washington D.C. In terms of salaries, as an office assistant, you can expect to earn a median wage of $37,870 per year, or $18.21 per hour, according to the BLS. Additionally, you can learn more about business careers on Monster. Computer-savvy office assistant relied on by executives and cross-functional teams as a problem-solver and provider of multifaceted administrative support. Proven facilitator of smooth operations, successful project deliverables and exemplary service levels for corporate and nonprofit employers. Certified Microsoft Office Specialist repeatedly recognized for communication strengths, business acumen, process-improvement contributions and diplomatic handling of sensitive matters. Manage administrative tasks supporting executive leadership and sales, marketing, finance, HR and operations areas for a leading medical device manufacturer. Coordinate accounts payable, accounts receivable, payroll, vendor management, returns processing, customer relations, executive calendars and report generation. Researched and rectified the root cause of shipping delays, accelerating order-processing time by 35% and increasing customer satisfaction scores from 80% to an all-time high of 92%. Recovered $18K after reviewing vendor and supplier invoices and identifying numerous overpayments. Partnered with IT team to transition thousands of records to the cloud. Efforts drove significant time/cost savings, heightened data security and improved team productivity via new file-sharing capabilities and first-ever “work from anywhere” remote accessibility. Replaced disparate processes and tools used for budgeting, payroll, purchasing and expense tracking with standardized solutions that improved financial controls and reporting accuracy enterprise-wide. Advanced through rapid promotions as a commended provider of front-/back-office administrative support for a global nonprofit agency, culminating in selection to serve as executive assistant to CEO and COO. Coordinated domestic and international travel for executives. Negotiated deep discounts with hotels and rental car agencies, cutting travel expenses by 35%. Helped plan, promote and manage meetings, fundraisers and other events. Organized logistics, led major donor communications and contributed to marketing materials to help generate up to $1.5M per event. Praised for timely, accurate spreadsheets and reports used as decision-support aids by CEO and BOD. Before you submit your resume to office assistant jobs, you want to make sure you're including all relevant skills and experience. Could you use some help double-checking your work? Get a free resume evaluation today from the experts at Monster's Resume Writing Service. You'll get detailed feedback in two business days, including a review of your resume's appearance and content, and a prediction of a recruiter's first impression. It's a quick and easy way to strengthen your candidacy and set yourself up for success. Dr. Jose R. Maldonado Jr. M.D. Part-Time Office Assistant (30-35 hours/week)- Small, Stable Growing Office!